Having your backtest analysed and diagnosed is pretty simple. All you’d need to do is log in to Darwinex and select “Backtest” in the “Trading Accounts” section. Once there, you’ll be asked to choose a base currency for your backtest, as well as a strategy name, etc. 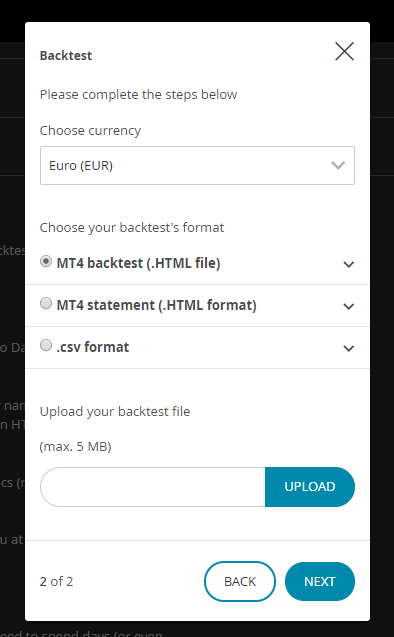 Also, as you can see below, you’ll need to pick the format of the backtest you are about to upload (MT4 backtest in HTML, MT4 statement in HMTL or backtest in CSV format). Once done, click the “Upload” button and our algos will calculate your account’s basic statistics (return, DD, etc.) as well as more complex variables like VaR, attributes and D-Score. Analysis might take up to 24-48 hours to appear. Backtests from MT5 accounts are currently not allowed. The advantages of uploading a backtest vs. a demo account are numerous. First, you don’t need to spend days (or even weeks or months!) to build a track record and test how it would have performed. Secondly and more importantly, our algorithms do analyse the D-Score & attributes for backtests, whereas demo accounts are analysed for basic figures such as return and DD only. This makes backtests way more powerful to optimize your strategy than demo accounts! The one thing backtests & demo accounts have in common is that neither of them are eligible for investors nor for the DarwinIA trading contest.